This series refers to an imaginary place, Complex County. If you arn’t familiar with it, you should read The Role of Prices, Prelude. Prices are a reflection of worth, and goods and services are worth different amounts to different people. Prices instantly communicate the sum of all costs and cost-savings for a product or service. Prices provide a mechanism for automatically distributing limited resources to places of need. High prices result in lower prices. Since the villages of complex county operate under a free market economy, individual merchants in each village list their products for the price of their choice. The average merchant might look at how much merchandise he has, the cost of any materials he had to use, and the price of his own food and shelter when setting a price. A worker is a merchant when he markets his own labor. Each merchant naturally tries to maximize their income/profit. People in the county who buy things naturally look for the lowest prices. If they want something more desperately (i.e. it is worth more to them), they will pay more. If they want something less desperately (i.e. it is worth less to them), they will pay less. For example, in Appletown, apples are plentiful, easy to grow, and don’t have to travel a long distance to market. A citizen of Appletown would not be willing to pay a high price for an apple. Likewise, a merchant of Appletown doesn’t have to spend a lot of money on labor (because the land is so fertile) or lot of money on transportation and can therefore afford to sell apples at a lower price. Also, the merchant is only one of many apple merchants in Appletown, which motivates him to keep his prices low in order make a sale. For example, the village of Woodville is apple-poor. However, there population size (amount of workers) is still moderate. Since workers must eat apples for food but there are not many apples, the price of an apple in Woodville is high. There are a few apple merchants who grow apples in Woodville, but it is expensive because the land is not well suited for growing apples, and because there are a lot of workers to feed. So the price for apples in Woodville is five times more expensive than the price of an apple in Appleton. If you are a merchant in Woodville and half of your land is dedicated to apple farming and the other half is dedicated to pine tree cultivation, you might decide to sell your pine trees and plant more apples, since apples probably bring in more profit due to their high price. If you are a merchant in Appletown and you see that the price for apples is five times greater in Woodville, then you will probably take your apples to Woodville to sell. In both cases, apples were automatically diverted to the town of Woodville to meet the need. There was no fancy coordination involved, it was just the price that the workers of Woodville payed for apples that made it all happen. Conversely, a price that is too low will result in a higher price. An example of this would be in Appletown if there was a drought. Last season’s price of an apple would be much too low this season, since Appletown would not have nearly as many apples this season because of the drought. A merchant selling at last season’s prices would quickly realize that his apples were in high demand, and could therefore charge a higher price for them. These two forces, high prices resulting in low prices and low prices resulting in high prices, begin to find an equilibrium. At equilibrium, prices won’t change until something that affects the supply, demand, or other aspect of the cost of a good or service. You’ve discussed important, inescapable fundamentals that too many people have begun to consider negotiable. This is the basic framework for globalization. 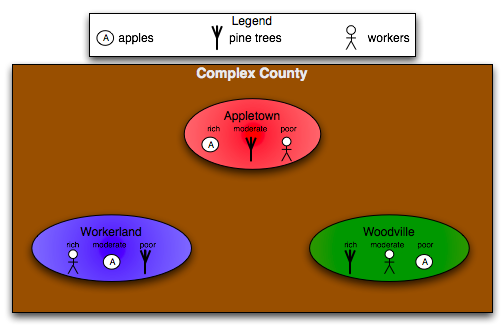 Regions with a natural disposition towards growing apples would be foolish to invest their limited resources and capital in growing trees when they can be imported at a cheaper rate from Woodsville. Tariffs can be used to protect the domestic pine tree market but that will result in inefficiency that will drive innovation down and prices up. In order to participate and compete in the global market under free market principles (minimal government intervention) we need to foster our indigenous competitive advantages and reinvest the money we didn’t waste on disadvantaged markets in research and development I’d our naturally competitve industries. Instead we lament outsourcing as unpatriotic and stymie our own progress. And unfortunately sometimes people see a tariff as a protector of the people because there is an illusion of job/money saving. It is difficult to see the second and third order effects of those actions – that it increases the cost for everyone doing business and is less efficient. Could it be a part of the American “buy now, pay later” or “instant gratification” behavior trends we see? Thank you! I had to make a lesson plan for Role of Prices for my Economics class as an assignment. I showed the video and example and got an A! Again, Big thanks! Glad to hear! Sounds like your economics prof knows a good thing when they see one =). Take care! 1) Are you not just (not to sound offensive!) recycling these ideas atm. 2) Or, in particular, does complexity science reveal somehting new about these ideas. Becasue classical liberals like Hayek have a tendency to think the tools of economists cannot usually be used to model these phenomena (even though many are trained as economists! )…ive always wondered though if spontaneous order (and the idea of “competition as a discovery mechanism”) could be mathematised in some way…do you think complexity science could allow for this?? More so the latter. I have studied independently both economics and complexity science, and I see significant interactions. Each of these fields influences my understanding of the other. If you want to truly model an economy, you will have to use the tools of complexity science (e.g. Complex Adaptive Systems), not aggregate mathematical models. Those mathematical models don’t allow for emergent phenomenon and are therefore fundamentally flawed (coming from someone who has used them before, albeit on a small scale).